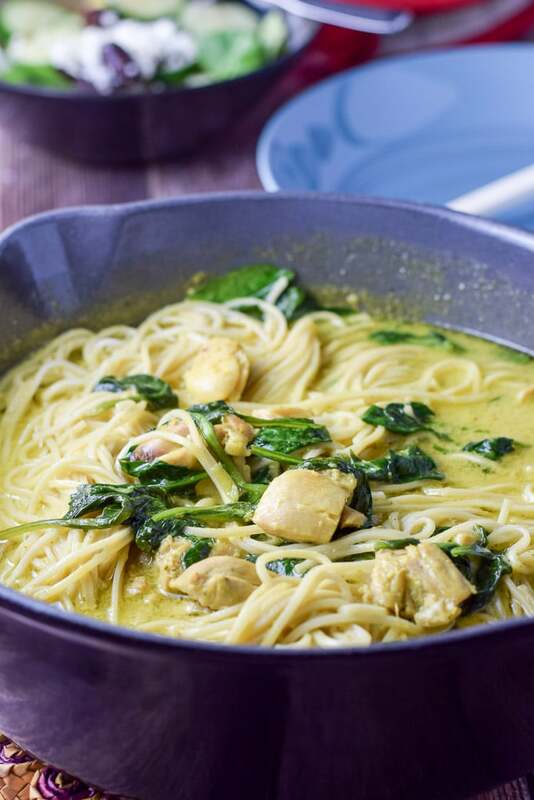 Who doesn’t love this chicken curry noodle recipe? I haven’t met anyone yet, so I’ll keep making it and feeding it to the masses to find out who that crazy person might be. So why did I name this the ‘devious’ chicken curry noodle recipe? Because once you taste it, you will deviously plot to have it again and again and again. But then you think, if it’s so darn good, why would you have to be devious when you plan to make it? Because wouldn’t everyone else love it and be on board to consume it? In fact, that is the problem. As a result, since they love it too, that means there will be stiff competition. So, one must plan to make it when there are few people around. Hey, you can even make it when you are alone, before your spouse/significant other/roommate/ or whoever is otherwise in the running to consume this chicken curry noodle dish. More for you. That’s my motto. Not that I don’t like to share, but I do have limits, don’t I? You will see what I mean when you make this! 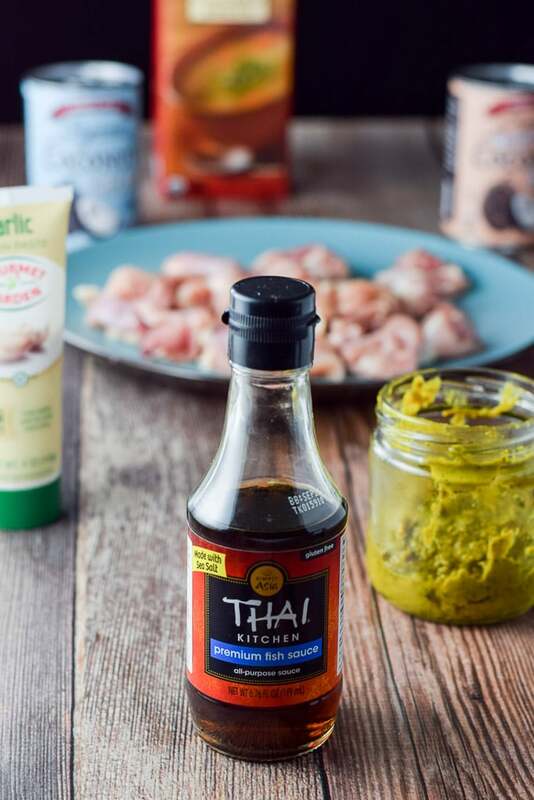 We have fish sauce, yellow curry (which is Pinch of Yum’s recipe), cut up chicken thighs, garlic paste, coconut cream and milk and chicken broth. First up is to sauté the chicken. I turn the heat under my sauté pan to medium and once the pan heats up, I add 2 tablespoons olive oil. Then, once the oil has heated up, I add the chicken and stand over it while it cooks. As a matter of fact, I give it 2 minutes each side. Hence, it takes about 6 minutes for it to almost be cooked through. Finally, once it is, I remove the chicken from the pan and set it aside. I fill a sauce pan with water, 2 – 3 inches deep and set it to boil. Next, I add a heaping 1/2 cup of yellow curry paste to the same pan and also add 1 can of coconut cream as well as 1/2 can of coconut milk, 2 tablespoons fish sauce, 2 teaspoons garlic paste and 2 teaspoons ginger paste. I bring the mixture to a boil and turn it down to a simmer. By now, the water is boiling so I lightly salt it and add a 6 ounce package of chow mein noodles. They only take 5 minutes so I diligently set my timer. Finally, I place a few handfuls of spinach and the chicken back in the pan with the curry sauce and let it all simmer as the noodles cook! I drain the noodles and place them in the pan with the chicken curry. All done! Mmmm. Doesn’t that look scrumptious? But look at all that curry sauce! Then I make a salad and get my chop sticks. Furthermore, I serve myself a big honking bowl. Delish! Don’t worry because even though I’m devious about this dish, Christopher did eat his fair share! In conclusion, I hope you enjoyed this recipe! Please leave me a comment telling me what you deviously hide from others because you want it all for yourself! I would love to know in any case! 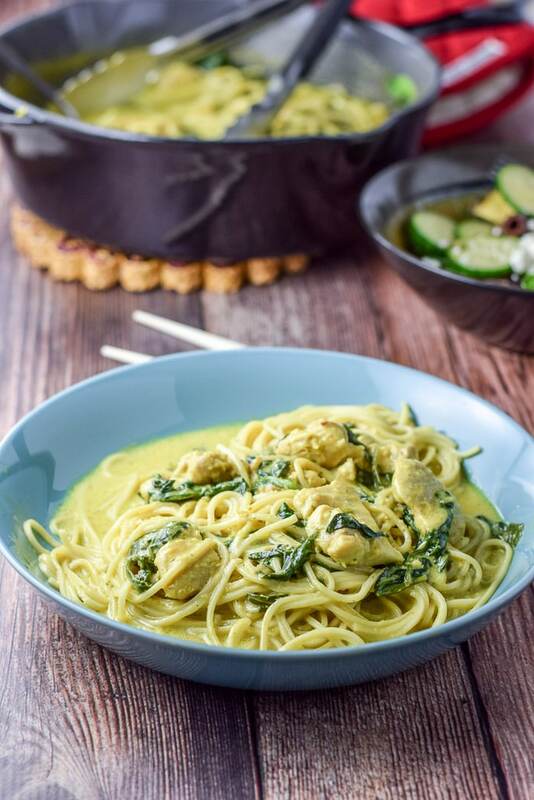 If you’ve tried this chicken curry noodle or any other recipe on the blog, I’d love the hear what you thought about it in the comments below. I love hearing from you! You can also FOLLOW ME on FACEBOOK, TWITTER, INSTAGRAM and PINTEREST to see more of my delicious food and delightful cocktails! 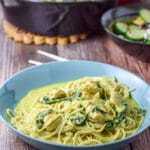 Curry noodles are so good, add chicken and you have a winning combo! How can a make this without having to share? You’re right, I’m gonna have to make some plans! OMG, the flavors in this noodle dish! drooling! Thanks Suzy. It’s so good! This looks so delicious! I still have never purchased fish sauce and always sub other things in my curries but I think I need to give it a try! I really like it Emily, I was skeptical of using it until I did and now I’d always use it, unless I were cooking for a vegetarian! This looks so lovely, noodles and curry flavour are so perfect! Love your title! I think I might love the garlic paste and ginger paste just as much. This sounds delicious. My mouth is currently watering. I think these might be my new adult version of chicken soup! Pass on over a bowl please! YUM!! That looks amazing, I pinned the recipe for later. Thank you Silvia!! It’s delicious! I put a Thai curry in front of him, he’ll be so happy! Thanks Anne! Yes, I bet he will be happy. I like rice noodles too and have made it with them. Yummy! I see you’ve got our number because we are ALL about the curry in this household! Can’t wait to give this one a try! Love the curry flavor so much and combined with the noodles is so so good. My husband and step son would be all over this dish! This is SUCH a great noodle and curry dish. The flavor of the curry sauce is crazy good and the noodles are not your average semolina. They’re somethin’ special for sure! Thanks so much Chris. You are a doll! I can totally see myself making that again and again too. Yay Sandi. That’s what I do!! I love curry noodle with any meat or tofu! I deviously hide cookies. And last slices of ice cream pie. But I would hide this too. For reals, it looks amazing! Hehe Amy! Thanks. Luckily my hubby doesn’t eat a lot of the things I would normally hide, so I don’t have to – like cookies and chocolate! I love Chicken Noodle Soup! And this version looks fantastic! Can’t wait to give it a try! This looks so great! Perfect for a nice Friday night dinner at my house! i’ll be making this one soon!! Thanks Amanda, you’re going to love it. Yum – I could go for a big bowl of this right now! I love noodles and I love curry. This is right up my alley, yum!